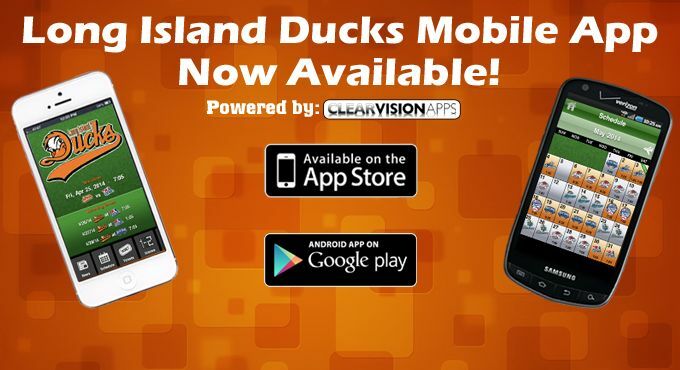 The Long Island Ducks are proud to offer fans an official mobile application, powered by ClearVision Apps. The brand new app provides Ducks fans with everything they need to follow Long Island’s hometown team right on their mobile device, is free of charge, and can be downloaded HERE (Apple-powered devices) or HERE (Android-powered devices) or by searching “Long Island Ducks” on your iPhone or smartphone mobile device. - Merchandise Store and more! The Ducks official mobile app can be downloaded by visiting the Apple App Store (iPhone, iPod, iPad) or Google Play (Android-powered devices) and typing “Long Island Ducks” in the search bar. The app is free to download and use for all fans. To receive push notifications from the team, including breaking news, game status updates and special reminders, please select “Ok” when prompted to do so.